indian beer geek: Brew your Own Mumbai! All you guys who keep writing to me about home brewing, here is a great opportunity to see and learn practically. 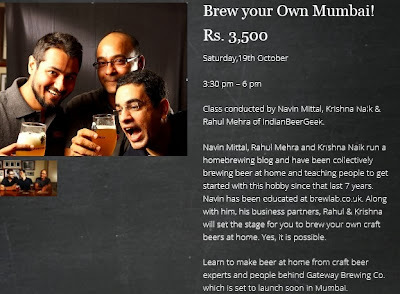 I, along with Rahul Mehra and Krishna Naik of Gateway Brewing Co., will be conducting the home brewing class. Do attend if you are keen on starting this hobby. NOTE. WE AREN'T TAKING CLASSES ANY MORE BUT WILL GUIDE OVER EMAIL. I wanted to attend the workshop but unfortunately cant make it on 19th Oct 2013, are there any other workshops available at a later date. I wanted to attend your workshop on 19th Oct but cant attend due to prior commitments, are there any workshops available at a later date. This blog is about my adventures in homebrewing and through this, I hope to convert many into passionate homebrewers. 2. What is beer? How is it made?